Teacher efficacy (this was a new word for me! ): the confidence teachers have in their teaching and their ability to meet professional challenges. I recall the beginning of my teaching career as being torturous some days. I went home and cried every day until April! I was NOT confident and definitely NOT a well-balanced teacher; I was a hot mess! Who wouldn't want these behaviors?! However, in a culture of "praise junkies", many people are unable to feel validated or competent unless others are telling them how wonderful they are. Begin to self-assess more often. Examine what you do well so YOU are proud of successes in the classroom. What does it mean to be a good teacher? 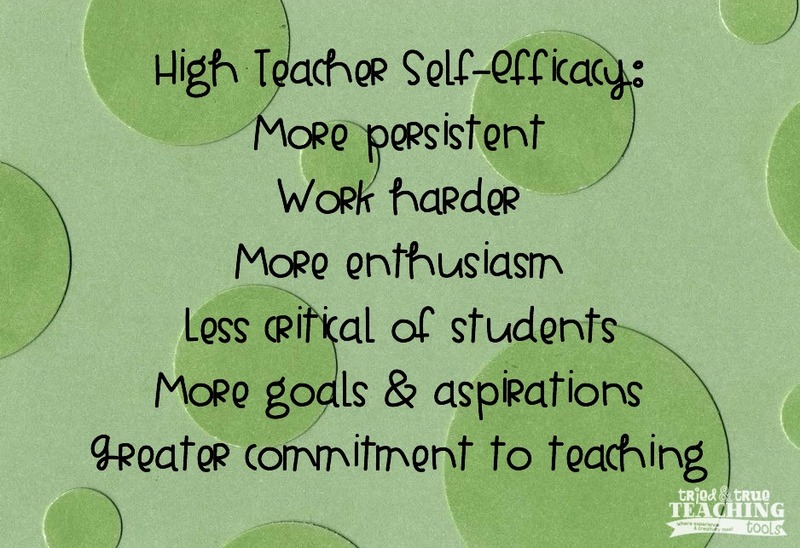 Teachers with self-efficacy focus on what they CAN control when setting goals for themselves. Anderson gives charts with many specific examples for setting practical goals. In an interview with a veteran teacher who has not let all the changes in curriculum and district mandates get to her, she keeps a journal that she jots notes in at the end of each day. She has 2 columns: SUCCESS and NEXT STEPS. In this way, she is constantly reviewing what went well in a lesson (keep for next year) and what needed to be changed or what students didn’t understand. Frequently assessing our own teaching keeps us feeling in control and we can make specific changes as needed. Personally, I love to teach writing and I love the concept of mini-lessons during Writers’ Workshop. However, I notice my “mini-lessons” often turn into full-blown (aka LONG) directed teaching sessions, leaving my students with little time to write (& missing the whole point of "mini")! THIS is an area that I can directly work on improving! When we have confidence that we are being successful with our students, then we will not only achieve self-efficacy, but we will ENJOY teaching!